Late last year, we were invited to join a plenary at the NACTO: Designing Cities 2017 Conference in Chicago. The hour-long session, entitled “Seeing is Believing: Experiencing the Street Renaissance”, featured talks from Global Designing Cities Initiative’s Anika Chachra, City of San Jose’s Ed Solis, City of Boston’s Kris Carter, and Go Bronzeville’s Ronnie Matthew Harris. When an audio recording of this session was released last week on the Talking Headways podcast, we received several requests for the accompanying visuals. 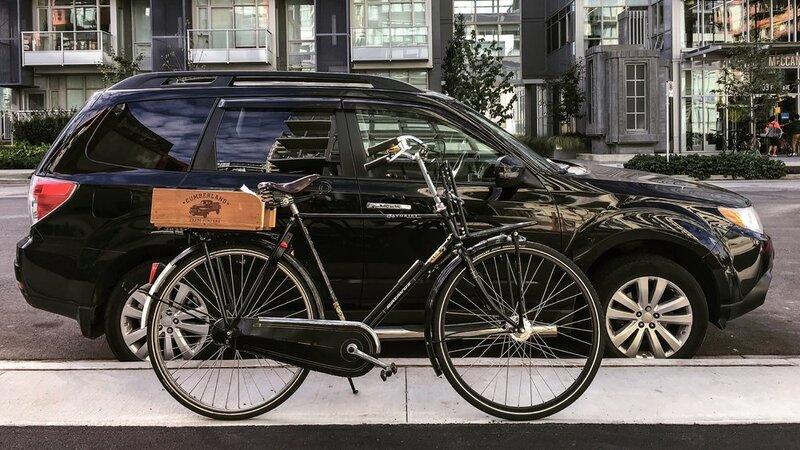 As a result, we are pleased to present a full transcript of our presentation, called “8 Rules of Effective (Bike) Marketing,” which includes the concurrent photos and videos. The two of us have had the privilege of living, working, and cycling in Vancouver for over ten years. 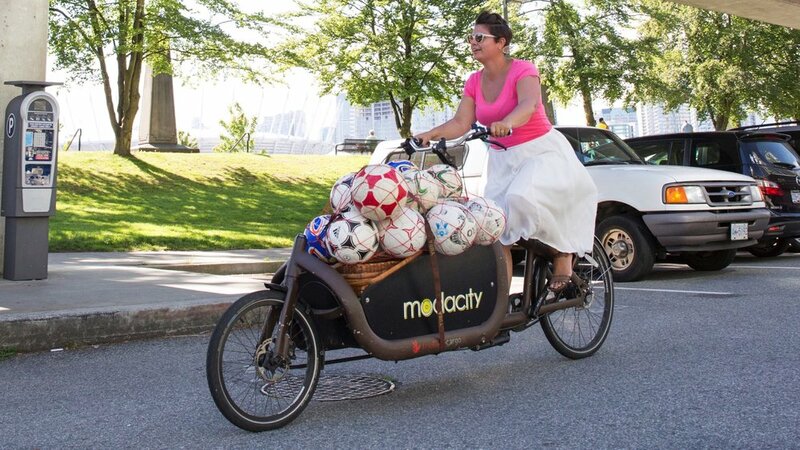 Three-and-a-half years ago, we started a creative agency – named Modacity – that stemmed out of our bike advocacy work. Over that period, we’ve been lucky enough to work on a number of photography and film projects for a variety of public and private partners around the world. Today we’ll share what we’ve learned over the years, and demonstrate how thinking more critically about the imagery we use helps to achieve the goal of building safer streets. Our hometown of Vancouver has made some tremendous strides as a cycling city over the past decade, rolling out an AAA (all ages and abilities) bike network on the downtown peninsula. But we found ourselves frustrated with the idea that getting on a bicycle was an athletic pursuit; that it was dangerous, political, and complicated. We didn’t see the changing demographics on the cycle tracks represented in the imagery presented by the media, advocates, or the City of Vancouver. So we set about changing that misconception, initially through passion projects on our evenings and weekends, which quickly snowballed into full-time job. Before we get into the eight rules of bike marketing, we want to talk a little about why the images we use are so important. Whether it’s on social media, illustrating an editorial, or envisioning a film project, selecting the right images can help build the political capital needed for better bicycle infrastructure. They can get the public, press, politicians, and business community on board with your cause, and building safer streets is much easier with them on your side. Hopefully, these images will stir their imagination, and help them realize a vibrant city isn’t about two lanes of fast-moving traffic, and two parking spots outside their front door. You only have to delve into the comment section to realize how we’ve organized ourselves by how we get around. Transportation tribalism is a destructive mental barrier both on and off the streets, despite cities becoming more multi-modal places. We believe that presenting a face and story to the “person on a bike” will hopefully help shed the label of “cyclist”, and humanize them. If anything, it reminds drivers the next time they encounter someone on the road, they’re also a mother, father, son, or daughter, with their own hopes, dreams, and aspirations. Finally, we hope that through the imagery we use, we are normalizing the act of utility cycling. Most North Americans still see biking as a recreational pursuit, one that’s primarily done for fun or exercise. They can’t imagine a world where they would cycle to the shop or restaurant, or take the kids to school. So we strive to make bareheaded cycling in regular clothes, hauling a bag of groceries as normal here as it is elsewhere, be it Amsterdam, Copenhagen, Vancouver, or Chicago. In a post-truth society, people believe what they feel to be true, and not what the facts and figures actually state. Fear, uncertainty, and doubt are very normal reactions to change, and bringing facts to a culture war is like bringing a spoon to a knife fight. We must learn to set aside the graphs, charts, and statistics on which we normally rely, and connect with people on a human level. We should explain how they will benefit personally from a “controversial” change to a streetscape. Therefore, it’s imperative that we learn to tell stories, craft narratives, and shape messages that appeal emotionally to our fellow citizens, rather than intellectually. Both our personal and professional circles – online and in real life – are becoming increasingly self-reinforcing and self-congratulatory. We tend to surround ourselves with like-minded people, while algorithms feed us news and ideas that strengthen our existing worldviews. We must learn to break out of those echo chambers, and stop preaching to the converted; thinking bigger and more creatively to get outside of our existing feedback loops. This will help spread our important message to a much broader audience, challenge us to think differently about our problems, and take a diverse range of perspectives into consideration. We believe it is crucial to be aspirational in the types of imagery you use. Remember: it’s a marketing exercise, and not a documenting one. It’s important to represent the type of people you want to see cycling on your city’s streets, not the ones currently using them. That includes a variety of ages and abilities, taking into consideration the type of bikes they’re riding, as well as the types of clothing they’re wearing. And yes, it’s totally fine to show people riding without helmets, if, like us, that’s the type of bike culture you ultimately envisage for your city. 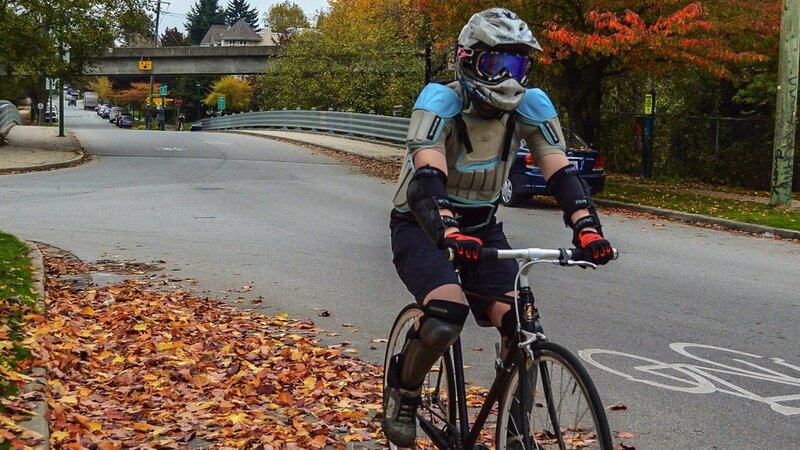 In a similar vein, it’s important to show a variety of ages, ethnicities, and body types in the imagery that you use, because, “If you can’t see it, you can’t be it.” The worlds of cycling, transportation, and urbanism are still very pale, stale, and male. Things are slowly getting better, but it will take decades to address. In the meantime, we should share the stories of those often-ignored people that are cycling, or would like to cycle more. This reinforces the idea that building safer streets levels the playing field for all users, regardless of their income or influence. Marketing a lifestyle, and not a product is a strategy the automobile industry has employed for decades. They have been selling the ideas of joy, freedom, and unlimited mobility, even if it means stretching the truth, by showing streets that are free of traffic. We need to utilize the same strategies, although we would argue we are at least being truthful in our representations. For us, that means telling compelling human stories, where the bicycle plays a supporting role to the person’s lifestyle, rather than a starring role. Some of the biggest mental hurdles when it comes to urban cycling are the ideas that it’s dangerous, complicated, and sweaty. Moving forward, we must carefully consider whether the photo we’re including in that tweet or story reinforces those misconceptions. Infrastructure is definitely the most important thing to get the “interested, but concerned” crowd on bikes, but they also may need a little coercion. Once again, you may not be representing the exact conditions of your streets. But that’s okay, it’s a marketing exercise. The media loves a conflict, and with proposed cycling projects, it will unquestionably focus on the controversy involved. We seldom see “good news” stories of new users and businesses resulting from those “controversial decisions”. Therefore, we need to provide a counter-narrative that reinforces the triple bottom line of safer streets; ie. their social, environmental, and financial benefits. And don’t forget these are more convincing if presented in an accessible and emotional manner, rather than using facts, figures, and charts. Finally, allow us to stress that nobody – we mean nobody – likes to be preached at. Part of the resentment of “cyclists” is the guilt drivers are made to feel for not riding a bike. We’re not going to guilt those people onto their bicycles, nor will we convince them via words. But if we show them that a more enjoyable, efficient, and enticing mode of transport exists, they just might give it a try. 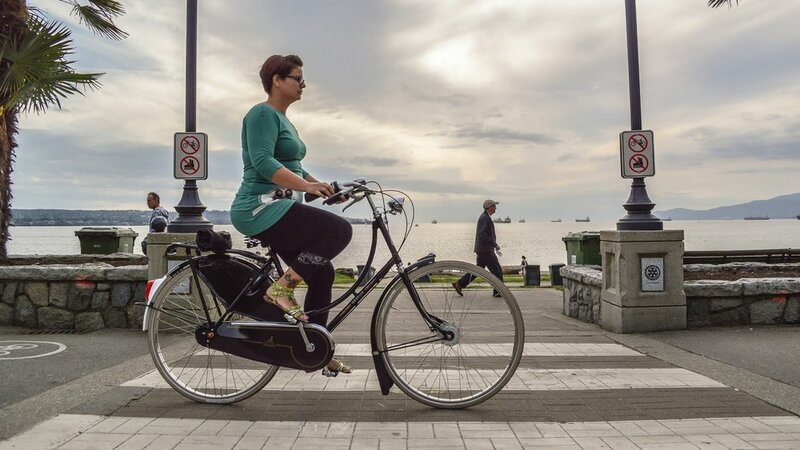 To close out this presentation, we’d like to show a trailer for a video series that incorporates each of these eight rules: the award-winning Vancouver Cycle Chic Films. This is a collection of 12 short films we produced between April 2013 and December 2014, each telling the personal story of someone we know who happens to ride a bike. Thanks again for your attention. Feel free to browse other videos on our website, and contact us via email if you have any questions or concerns.